Today I'm doing a quick post of a card I made a week or so ago. I usually don't hold back on posting cards, but this was for a friend's son who is graduating from high school ... and I didn't want to post it until he got it in the mail. I followed the owl as per instructions I saw on Mary Fish's blog ... thanks Mary. And I called the school to find out the color of the grad gowns, just so I could make it special. Hope you like. I stamped the woodgrain in Early Espresso ink onto Soft Suede cardstock. I sponged more Soft Suede ink overtop to darken. I punched out the owl, scalloped oval and itty bitty circles (for the glasses). I hand cut the grad cap and the arms of the glasses. The "diploma" is a scrap of computer paper rolled up and tied with more twine. I kept the card clean and simple, just adding the woodgrain at the bottom with some twine wrapped and tied in a knot. Labels: CAS, graduation, Stampin' Up! 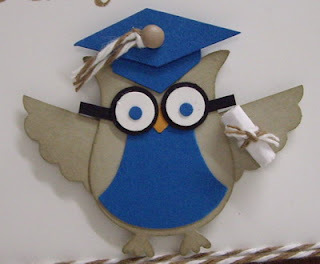 Love the owl and love the tassle. 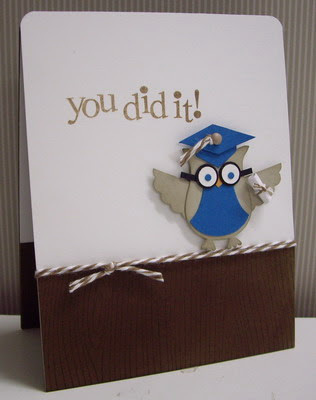 Made a card at a swap recently somewhat like this but used the envelope die and put a little card with a tab. Such cute ideas! Thanks for sharing. What an adorable clean and simple card! Loll, Alexander will love his card made especially for him. High School graduation is always such a big deal. TFS the close up of the owl and instructions. Loll, your designs are always a treat to see. And Mr. Owl is just the ticket to celebrate this young man's educational success! Another great CAS design.